Have you ever reacted negatively to a situation, only to find yourself regretting your response later on? Our natural emotional responses can be confusing sometimes, and may make us react to things quickly and without thinking about the consequences. Today I’ll teach you to recognize the invitation to pause while you decide, intentionally, how you are going to respond. I share my story of the first time I saw an opportunity to decide what I was going to make of a terrible situation and how I avoided unnecessary emotional pain. I tell you how my issues with thinning hair changed my problem-focused brain to a solutions-focused mindset. Listen in to hear the steps you need to take pause and create space to think about how you can make a better outcome for yourself. How to avoid unnecessary emotional pain. The difference between reactivity and proactivity. How I overcame my mental struggle with thinning hair. How to recognize the invitation to pause and decide your reaction. How to re-evaluate your responses and turn them into something proactive. The steps you need to become solution focused. 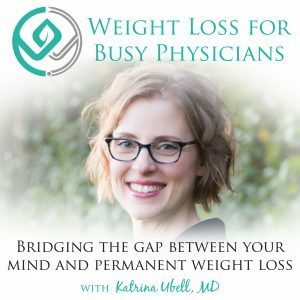 Katrina Ubell: You are listening to the Weight Loss for Busy Physicians podcast with Katrina Ubell, MD, episode number 115. 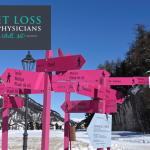 Welcome to Weight Loss for Busy Physicians, the podcast where busy doctors like you get the practical solutions and support you need to permanently lose the weight so you can feel better and have the life you want. 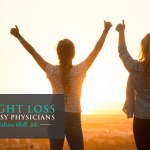 If you’re looking to overcome your stress eating and exhaustion and move into freedom around food, you’re in the right place. Hey, my friend. What’s up? How are you? Welcome to the podcast. Super excited to let you know that I now am ready to share the details of my upcoming live event that’s going to be on May 25th, so coming up here soon. I’m calling it Podcast Live because what we’re going to be doing is taking concepts that I’ve taught you on the podcast here, and we’re going to workshop it. We’re going to take these topics and go much deeper. What we tend to do on podcasts is we go in consumption mode, right? It’s so interesting, and we listen, and that’s cool. Then, later that day, we couldn’t even tell you what we learned. Now, not always, but sometimes this happens. This happens for me too where I’m kind of like, “Yeah, that was really good,” or maybe I tell someone about something, but then I’m not actually applying it to myself. I know that, for a lot of you, this work resonates with you, and you love it, and you’re super interested, but you’re not really applying it to yourself in the way that you would like to. You’re not getting those results that you really want. What I’m going to do is take you through some key concepts that I’ve taught you on the podcast, and I’m going to help you apply them to your life with lots of coaching, lots of time for questions. It’s going to be amazing, so definitely bring your sister, your friend, your mom, your coworkers, or totally just come by yourself. It’s totally not going to be weird if you come by yourself. You know me, I love going to things by myself, so if I were me, I probably would go by myself. Do not worry if you have nobody to come with you or you just want to go by yourself. It’s totally going to be great. You’re going to have a chance to meet other like-minded women. It’s going to be amazing. Or maybe men too. Men are allowed too. It’s totally great. To get all the details, all the information, go to katrinaubellmd.com/live, L-I-V-E, katrinaubellmd.com/live. You’re going to find out all that information. I really hope you can come and join me. It’s going to be so fun. When I think about it, I get so super duper excited, and I want you to be there, so definitely check that out. Okay. Today, we’re going to talk about reactivity versus proactivity. Most of us go through our lives in reactive mode, just reacting to what’s happening. Something happens, other people do something, or the weather’s certain way, or just something happens, and then we have a reaction to it. Really, anyone in our lives, but let’s just say our kids, they say something, and then we just react back, right, just like a split second. Sometimes we regret what we said later. Does that happen to you? Because it wasn’t coming from our highest and best selves, right? They said something, we reacted, and something flew out of our mouths, and it really wasn’t the way that we would choose to respond if we had a moment to think about it. Our brains often react with a lot of judgment and criticism and negativity. Have you noticed this? You’ve probably noticed it in other people. I wonder if you’ve taken time to notice it in yourself and where it’s coming up for you in yourself. Living this way kind of feels like being yanked around by your ponytail, so think about that, right? Someone just grabs your ponytail and yanks you. Because, really, this is the thing. You’re a good person, and you mean well. Your heart is in the right place overall. You want to live a good, meaningful, productive, valuable life. That is what you’re striving for, but then something happens, and you don’t even see it coming. You just react, and then you’re disappointed with yourself later for how you responded. It’s just like you’re just trucking along and, all of a sudden, you got yanked by your ponytail, right? Then most of us beat ourselves up for a while afterward thinking that, somehow, the self-flagellation is what’s going to help us do better in the future. What ends up happening is we don’t really do better in the future. We just feel worse about ourselves. Many of us, when we feel bad about ourselves, look to food and sometimes alcohol, maybe, for solace, right, to feel better about ourselves. When we react, we let our primitive brain be in charge in the moment. We’re living from our primitive brain in the moment. Something happens outside of us. This is the circumstance, the neutral facts of the situation. Then we live by just the first thought that comes to mind. That thought creates a feeling, and that feeling drives our action, which is a reaction. Your reaction is your action. Even if your reaction is to just go on a mental rant about somebody and not do anything outwardly, it’s still a reaction, still an action, but there is a space between the circumstance or the neutral facts and our thought that most of us don’t take advantage of. That space allows you to move into proactivity. It allows you to be proactive about how you want to think about the circumstance. It gives you the opportunity to decide what you want to make that circumstance mean. Viktor Frankl is a famous author, and he has a famous quote that you may or may not have heard. The quote is, “Between stimulus and response there is a space. In that space is our power to choose our response. In our response lies our growth and our freedom.” Let me just read that again. “Between stimulus and response there is a space. In that space is our power to choose our response.” Doesn’t just happen to us. “In our response lies our growth and our freedom.” If you haven’t read his book Man’s Search for Meaning, you definitely should do that, just as a side note. Really amazing book. The stimulus that he’s talking about is the circumstance. The response starts with your thought because it’s your thought that’s creating your feeling, which is then driving your action, which is the response he’s talking about. Your response is always going to start with your thought. Any action that you are taking or want to be taking starts with a thought. This is how you become proactive. You recognize that there’s an invitation to pause while you decide intentionally how you’re going to respond. The first time this became something for me that was an option, I actually saw, “Oh, my gosh. Here’s that opportunity. Here’s that space,” was a few years ago when I was on the phone with my mother, and she let me know that she had gone in for what she thought was just going to be a little routine thing, no big deal, at the urologist’s office, and they said, “Oh, before we do that, we need to just look in your bladder really quick,” and when they looked in there, they just happened upon a little bladder cancer. She didn’t have any information. She was completely taken aback by this, had not gone into the appointment with any kind of expectation of getting a cancer diagnosis, so she hadn’t even had a moment to really think about asking questions or things like that. I remember that we just really didn’t have a lot of information. I hung up the phone with her, and I just paused for a moment and I thought, “Okay, you have the opportunity right now to decide what you’re going to make this mean. How are you going to interpret this information that you just got?” That conversation with my mom was the circumstance, okay? I’ve gotten a certain amount of information, not enough information to know is this really going to be bad? Is this really not going to be a big deal? We’ve got to figure this out. We got to get more information. I could see those as facts, and I could see that I could turn this into super doom and gloom, I’m going to lose my mom, get super upset, be really worked up over this, or that I had another option if I wanted it. I literally did just decide, “Okay. Well, that happened. We’re going to find out more information. Okay. Everything’s okay. Right now, everything’s okay.” It completely changed my whole response of that. I mean I also know how bad bladder cancer can be. My brain reminded me of that, but then I thought, “No. I’m not even going to go there right now. I have this opportunity to decide what my response is going to be, and I don’t see the value in me creating a response that’s going to result in a lot of emotional pain for me that isn’t going to help anything.” You can see that. Sometimes, though, we think that our reactions are okay. We’re like, “No. Sometimes I react, and it’s a good thing.” An example of this is in the emergency department. A patient comes in trying to die, and you’re giving some facts by the EMS team. That’s your circumstance. You have a patient here and some data that the EMS team gave you. Then you have a thought about what to do next. That creates a feeling of maybe, say, motivation or determination. Then that feeling drives the action of you doing that next thing. We might think, “Well, see, I reacted, and that was useful,” but we know that the human brain can be very reactive in the moment, so in order to run a trauma in the most effective and efficient way, we’ve found that it’s really not best to just unleash a whole bunch of doctors into the room to do what they think is best in that moment looking at that specific body part that they’re looking at. In fact, a trauma is very protocolized. It’s organized chaos or chaotic organization, whichever one you want to choose to believe, right? There are checklists, and there’s protocols, and it’s someone’s job to oversee the whole process and to make sure that everyone’s individual actions are meshing together to work together to actually help save the patient’s life. It’s really not reactive in that sense at all. It’s actually something that comes from proactivity because whatever team has created the protocols previously were the ones who came up with a plan so that all you have to do, in the moment, is follow that plan. It leaves so much less room for that reactivity. Now, sometimes we don’t realize how reactive we’re being. We think that our reactivity is just an observation of how something is playing out in our lives. I’m going to give you a bit of a silly example but, for real, this was an issue for me for a while. Again, it’s silly, but just follow me because, sometimes, I think the silliest examples are the ones where we really see it the most, and we’re like, “Oh, okay. Now I can see how I might apply that to something that seems harder,” like your boss or something. I got this idea from a friend of mine that I should be put on some spironolactone. Crazy idea. I went to my dermatologist and said, “Will you prescribe this for me?” She’s like, “Hold on a second. Let’s just actually look here and figure this out.” As we looked at everything, she’s like, “Wait a minute. Didn’t you tell me that you had appendicitis earlier this year?” I was like, “Oh, yeah, I did.” She was like, “Well, hold on a second. Let’s just figure out the timeline of this.” I had had appendicitis, which I didn’t think was that big of a deal. Well, three to four months later, yep, that’s exactly when my hair all started falling out again. She’s like, “It’s just telogen effluvium. It’s just your response to that surgery.” I was like, “Really? Oh, my gosh. Seriously, every little thing that’s going to happen to me, my hair is going to fall out again.” Now I’m back again in the process of growing it back out again. Then, one day, I realized this. I just had this opportunity to think about it for a moment, and I thought, “You know what? What if I got into a solutions-focused mindset about this? What would I do?” I’m not joking. This totally changed my hair life. I just started thinking, in the past, what did I do that I liked with my hair? I thought back to college when I used hot rollers at lot, and I decided to try that. I looked at people online who I liked their hair. There’s some YouTube people who actually do videos on how they do their hair. I thought, “Well I can probably try that. I could probably get better at this. Maybe I should ask people who have nice hair how they do their hair, and then I could actually learn it,” because I had this idea too that I’m not good at it and I can’t do it. Turns out, I actually can. Turns out, if you just practice something, you get better at it. Did you know that? I’s so crazy. Even though my hair is totally in this state of growing in in kind of crazy ways, and there’s fly-aways all over the place, I’m learning how to manage it, and I don’t have the story in my head anymore that my hair is bad. I know what to do to manage it. It’s completely fine. That’s just a silly example of going from being super reactive, always thinking, “Oh, my hair, my hair. My hair is a problem,” to just being proactive, “Okay, what’s the solution here? What is something that’s going to work for me? There must be some way of figuring out a way to make my hair look good.” That’s exactly what I did, and it’s no longer a problem for me. From there, you can offer yourself the opportunity to pause and create that space for a moment. Maybe you could think, “I would typically think this or I would respond in that certain way. Is there another way that I can respond to this that will also feel true that creates a better result for me, basically a better outcome overall? Maybe I’ll try that here in the moment.” You just are going to play around with this. Don’t beat yourself up when you go right back into reactivity a little bit or maybe even a lot of the time, because that often happens, right? Just notice it, approach it with curiosity and openness and give yourself the opportunity to respond in a proactive way. Just play around with that idea. I think, so often, we try to force our brains into this different way of thinking normally, naturally, and it takes a lot longer than just like, “Okay, I just need to man-handle this, and then it’s going to be better.” You have to really approach it from a place of gentleness and support and lovingness. You have to nourish yourself, right? You have to be like, “Okay, if I were going to approach this differently, how might I do that? What might be another way? Let me try that out in the future. Let me try that out right now and see how that changes how I feel.” Then, from that place is when you’re going to be able to start truly seeing how that response is different for you, how it feels for you in the short term and the long term and then deciding if you want to continue with that ongoing. Give this a try. See what you think. Notice where you’re being proactive, where you’re being reactive, and see what you think. See how you want to change things. If you are wanting more information about coming to see me live, go to katrinaubellmd.com/live. It’s going to be amazing, and I can’t wait for you to be there. We do have a limited number of tickets, so I want to make sure that you get your ticket. Be sure to check that out. All right. Have a wonderful week, and I will talk to you next time. Bye-bye.